By Heather Dunigan, Wilmapco -- Shared lane pavement markings (or “sharrows”) are bicycle symbols that are placed in the roadway lane indicating that motorists should expect to see and share the lane with bicycles. Unlike bicycle lanes, they do not dedicate a particular part of the roadway for the use of bicyclists. Instead, sharrows encourage safe positioning, which results in better respect and an increase in separation between motor vehicles and bicyclists. They encourage bicyclists to ride outside the door zone, and on the road instead of the sidewalk - both of which increase the likelihood of crashing. The concept of sharrows in the US dates back to the 1993 Denver Bicycle Master Plan. In 2004, the city of San Francisco began experimenting with the design of shared lane markings which gave birth to the bicycle symbol with two chevron markings above the bicycle. 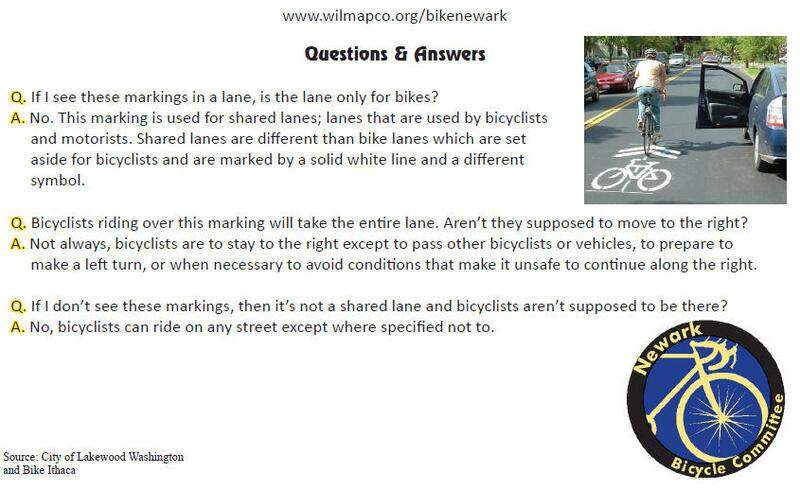 When the 2002 Newark Bicycle Plan was developed, use of sharrows was still very experimental. Thus recommendations focused on planning for an alternative route parallel to Main Street. The 2009 edition of the Manual on Uniform Traffic Control Devices (MUTCD) approved the use of shared lane markings for general use. 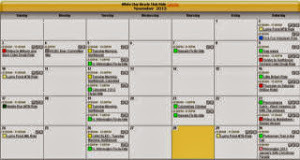 Also in 2009, City of Newark, WILMAPCO and DelDOT began development of a Newark Transportation Plan that was approved in 2011. Under the guidance of the Newark Bicycle Committee, sharrows on Main Street were identified as the top priority short-term improvement. In 2012, the City of Newark submitted a request to DelDOT for implementation of sharrows on Main Street. 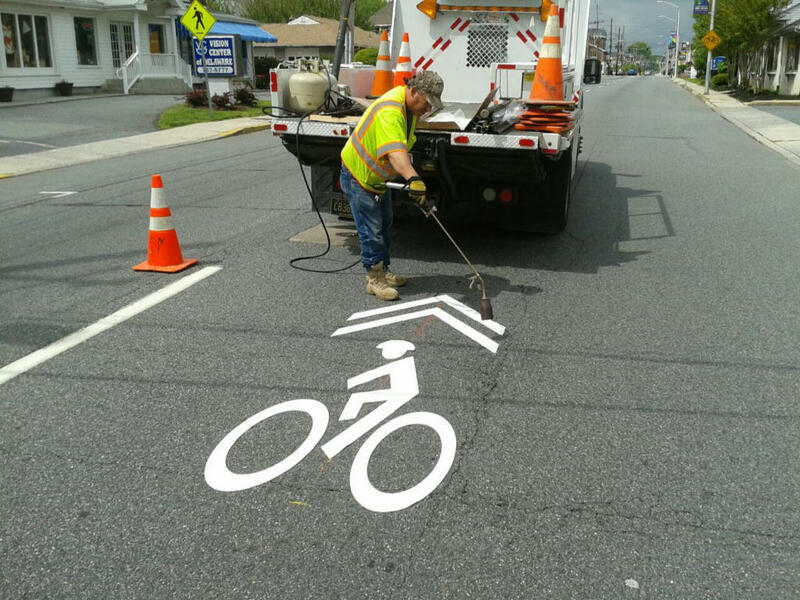 DelDOT responded that they would install sharrows as part of the next resurfacing project, but could not afford to do it sooner. 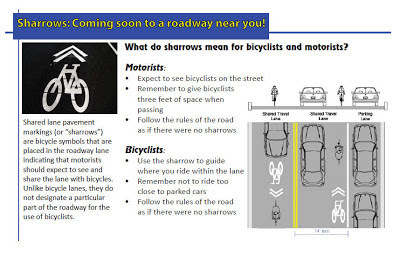 In 2013, sharrows were recommended in the draft 2013 Newark Bicycle Plan. Newark submitted a funding application to WILMAPCO and DelDOT for funding through the Transportation Alternatives Program, however due to prior project commitments, this request could not be funded through the federal program. In March 2013, Newark began the process of purchasing sharrows through City funds and will complete installation by May 14, in time for their official Bike to Work Day celebration. Uhhmmm... Why is the sharrow pictured in the middle of a wide lane with no parking? 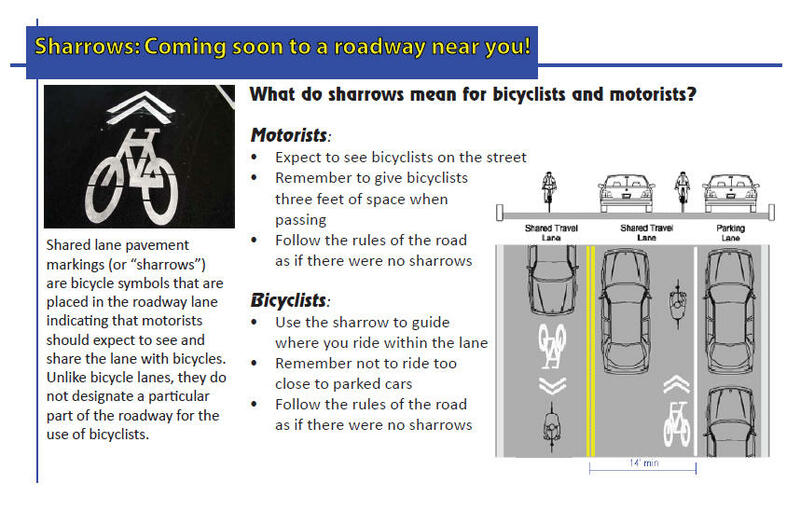 Then the diagram from Newark shows the sharrow in the "door zone". Stuff like this would leave me concerned. There is parallel parking throughout Main Street, just not very obvious in this picture. 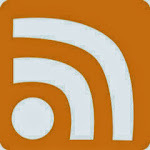 Traffic was off-peak during installation. Got it! Be careful to see if they actually work. Sharrows were very well installed in Princeton on very busy local roads and they are totally ignored by most local cyclists who continue to ride on the sidewalk like they always had. Just too much traffic for most casual cyclists to feel safe.